Forest fires are powerful and devastating. 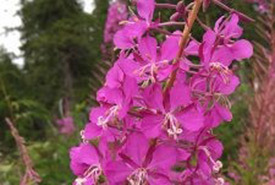 But they are also necessary for the rejuvenation of some ecosystems. Many plants are well adapted to fire. Some trees have dense bark or shed their lower limbs to help survive fire, while other plants need fire to initiate seed germination. Wildlife, like fire beetle, nighthawk, woodpecker and bear, move into recently burned areas. Because of climate change, fires are expected to be more severe and burn larger areas, and the fire season will be longer, with more ignitions by mid-century. This is bad news for species that aren’t well adapted to fire, because they will find it increasingly difficult to survive. 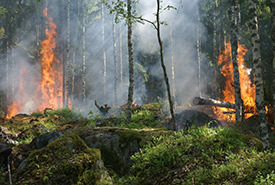 Humans are also affected by forest fires, particularly those living in or near forested areas, or who use forests for recreational activities or who are involved in the timber industry. One important thing to consider is the effect our fire management activities have on the response of a forest to a fire. 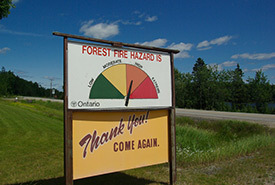 Natural Resources Canada describes fire management as the process of planning, preventing and fighting fires to protect people, property and the forest resource, using a broad tool kit, which includes the Canadian Wildland Fire Information System, Canadian Forest Fire Danger Rating System, Wildfire Threat Rating System, Canadian Fire Effects Model and Probabilistic Fire Analysis System. It also involves using fire to achieve forestry, wildlife and land use objectives. For example, forest managers may use prescribed burning to eliminate built-up fuel loads in forested areas, improve wildlife habitat or meet other resource management objectives. These planned and controlled burns are a versatile management tool, often used to reduce the risk of large, uncontrollable fires. However, many people are still resistant to controlled burns because public safety campaigns instill the idea that all fires are bad. Years of fire suppression by humans have caused the accumulation of significant amounts of woody debris — prime fuel for fire. 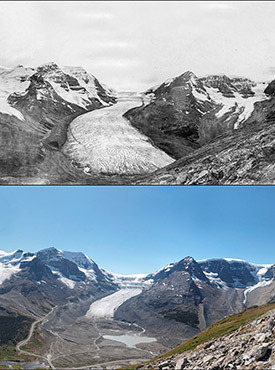 Climate change has caused dramatic changes in the Athabasca Glacier in Jasper National Park, Alberta (top: 1917, photo by A.O. Wheeler; bottom: 2011, photo by The Mountain Legacy Project) which affects the annual regional water availability and increases the risk of drought and fire. Photos courtesy of The Mountain Legacy Project (CC BY-NC 4.0) and partners at Library and Archives Canada/Bibliothèque et Archives Canada. We are seeing an overall increase in the frequency, duration and intensity of forest fires in Canada, the U.S. and around the world. Climate change is expected to change the regional availability of water, with some areas becoming more prone to drought, which will put them at risk for more severe burns. 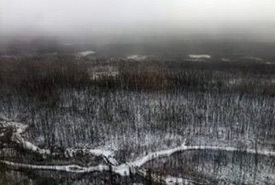 Science Borealis blogger Sarah Boon has previously written about the effects of drought on fires in northern Alberta. Although fires can be attributed, in part, to “people in the wrong places,” one of the biggest influences on fire is human-induced climate change (see the 2008 IPCC A5 report for more information). While occasional fires can benefit forests, climate change is making fires more frequent and more intense. So much so that some forest species are unable to recover from them. As some species are more sensitive than others, the increase in fire intensity is actually changing the compositions of both plant and animal communities. The large fuel load that results from fire suppression practices, coupled with climate change-induced drought, means that fires may burn hotter and longer than many forest species can tolerate. Under these circumstances, plant species that typically require fire for regeneration can be overburned, effectively sterilizing the forest floor seedbank instead of stimulating it to grow. We’re starting to see these impacts as forests are recovering more slowly, and species are recovering differently. Extreme fires can pose a risk not only to human health and well-being, but also to wildlife. It’s not just a matter of avoiding fire — a deer can run away from a fire, while a salamander cannot — but also the loss of critical habitat. 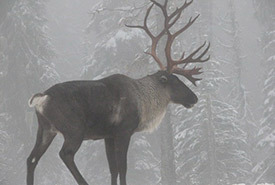 For example, the threatened caribou, especially subspecies like woodland caribou, may be in trouble if the lichen they depend on for food can’t recover quickly enough after fire. The effects on other species at risk (especially those with long migrations or those that aren’t mobile) may be severe as fires continue to burn hotter and longer. The combination of climate change and frequent fires means that affected forests may never grow back, causing other problems, such as erosion and flooding, that remain long after the fires are out. In the short term, we can permit more controlled burns in key areas to help decrease the severity of fires when they do occur. And although humans are not going to stop expanding into new areas and fires are not going away, University of British Columbia professor Lori Daniels points out that homeowners can take steps to minimize and mitigate the effects of fires, even if they don’t live in fire-risk zones, by following the recommendations of FireSmart Canada. These include maintaining a minimum distance of 10 metres between a building and untreated fuels (for example, vegetation); removing ground-level fuels, litter and downed trees to prevent fuel accumulation; and planting less fire-prone species of vegetation if it is ecologically viable. Ultimately, though, action to mitigate climate change itself is required to decrease the impacts and risks of fire to Canadian forests. So, if you want to help, consider decreasing your carbon footprint as well. This article was written by Tanya Samman and Alina Fisher, environmental and earth science co-editors at Science Borealis, and originally appeared on their blog. Science Borealis is a group of Canadian science bloggers who joined forces in 2012 to form a community-driven endeavour, aimed to grow the Canadian science communication community, while raising awareness of – and support for – Canadian science. Read more about Science Borealis.